"Enter the gates of Ravens Bluff, The Living City. Nestled in the Forgotten Realms, the city calls to adventurers. Inside the gates are many businesses with colorful proprietors, officials and noblemen working to shape the city's future, and exciting adventures just waiting to be joined. 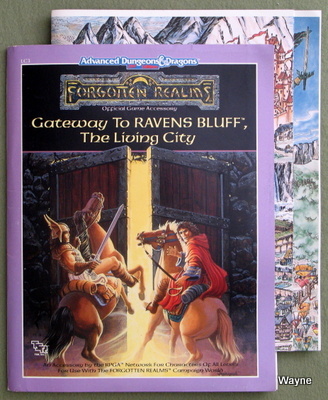 This product, created by RPGA Network members, features several businesses and officials, a complete city adventure, a Ravens Bluff encounter chart, and more. 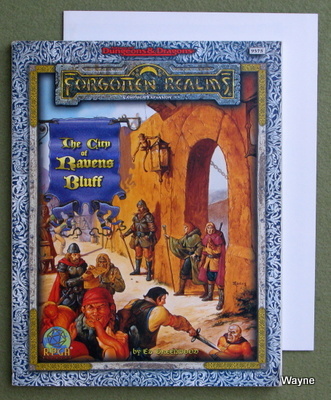 A large, full color map of Ravens Bluff is included. 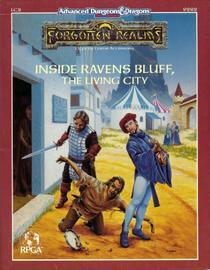 Enter the gates of Ravens Bluff, a city that is ever-changing and growing, a city you can be a part of in the Forgotten Realms." "Continue your tour of the Ravens Bluff campaign setting, the brightest spot on the Dragon Reach. Meet Jack Mooney, proprietor, manager, and ringmaster of the Realms' largest traveling circus. Lucky visitors receive invitations to out Party on Embassy Row, where intrigue and high society collide. Visit Lord Mayor Charles Oliver O'Kanes's study for a quick peek at Elminster's notes on Ravens Bluff and environs. Discover more new businesses, personalities, and officials -- including the Vulture, the city's infamous tax collector. All stops on you tour will add adventure to your travels in the FORGOTTEN REALMS campaign setting." "Situated where the Fire River flows into the Sea of Fallen Stars, Ravens Bluff is a bustling port and trade center. Residents and frequent visitors to Ravens Bluff often boast that the city is the brightest spot on the Dragon Reach, but even the proudest citizen thinks twice about taking to the streets when the Veil, a thick, cold fog, rolls in. The veil turns the city's vigorous docks into a gloomy den where only the brave, the stubborn, or the foolish go abroad. 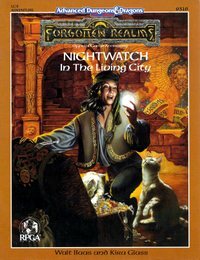 When the veil drops, neophyte adventurers join the Nightwatch, a special police force that sees to it that the fearless citizens who prowl through the Veil restrict themselves to licit business. A successful tour in the Nightwatch means wealth and recognition (those who fail quietly join the uncounted dead). This module is specially designed to introduce novice characters to the rigors of adventuring." I have never seen the 3-D ship assembled. Instead of giving the ship cut-outs their own dedicated cardstock, they're printed on the interior of the cover. You can't just cut-out the pieces, even if you were OK with destroying your module. The directions indicate that the main deck is too small and needs to be zoomed larger with a photocopier. "Ahoy maties! Cast off for adventure with the members of the RPGA Network. Get to know one of the busiest ports of the Sea of Fallen Stars, where adventure awaits on land, at sea, and below the waves. Pirates, honest sailors, smugglers, fishermen, and water creatures rub shoulders with stalwart adventurers bent on exploring the ships in the harbor, businesses on the waterfront, and a few mysteries less audacious locals prefer to ignore. This product contains new buildings and personalities for the FORGOTTEN REALMS Living City campaign setting, and your own 3-D fold-up ship." * The movers and shakers of the city are described in detail, from the deans of the Wizards Guild to the prelates of the Clerical Circle, from Lady Mayor to the heads of the noble houses. * The laws of the city are revealed, along with the officials responsible for enforcing them and the punishments for breaking them. * Read the history of the city and discover the secrets of Lost Sabreen, the dwarven city buried beneath its foundations. * New monsters and new magics, hidden cults and secret societies, and a description of the entire Vast surrounding the city are all included within these pages. * As if this were not enough, this sourcebook also includes the most detailed map of the city ever published and an extenstive Walking Tour visiting hundreds of locations throughout Ravens Bluff. Come join one of the largest and oldest RPG campaigns in the world! Find out why it has attracted some of the best players in the game today. Accept the challenge. The Living City awaits..."